Even though it’s cold outside – ice cream is still number one on my list of favorite indulgences. What? You too? Nice Cream for Everyone! Even though I could eat ice cream every day – I sometimes appreciate having something a little more guilt-free. 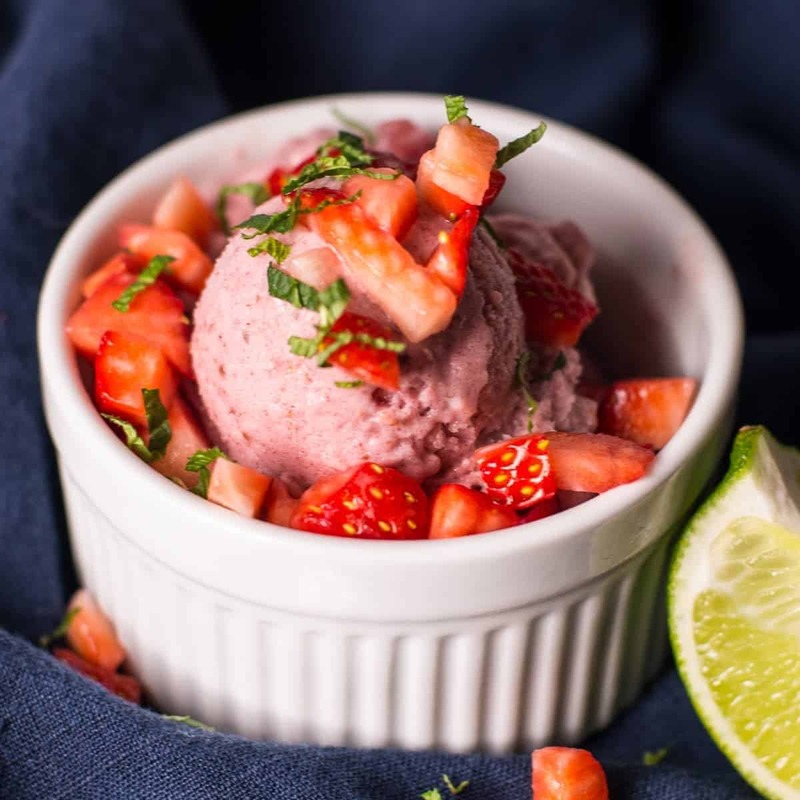 Strawberry Mojito Ice Cream is the perfect excuse to give this healthy, dairy-free version of ice cream a try. There’s nothing artificial or processed to feel bad about – maybe that’s why it’s so nice! Nice cream is made entirely of frozen fruit –well, and a little coconut cream. This version is one of my favorite flavors to date. Fresh strawberry was a natural choice since it’s my daughter’s favorite ice cream. I decided to adult-it-up a bit and give it a mojito spin. The fresh lime juice and mint is a perfect addition to this creamy, fruity bowl of deliciousness. A little freezer time equals scoop-able fresh strawberry deliciousness! Talk about the perfect use of leftover bananas. Anytime I have leftover bananas that are getting a little too ripe I just peel them, toss them in a freezer bag, and then into the freezer. You’ll be ready to make a batch of nice cream anytime the mood strikes. Frozen bananas are also great to have on hand for smoothies. Strawberry Nice Cream is Just one version of this dairy-free treat. Almost any fruit can be swapped in for the strawberries. Frozen fruit is easy to come by in the grocery store and even easier to keep on hand. I always have some version of frozen fruit in my freezer just hanging out waiting to be a smoothie. 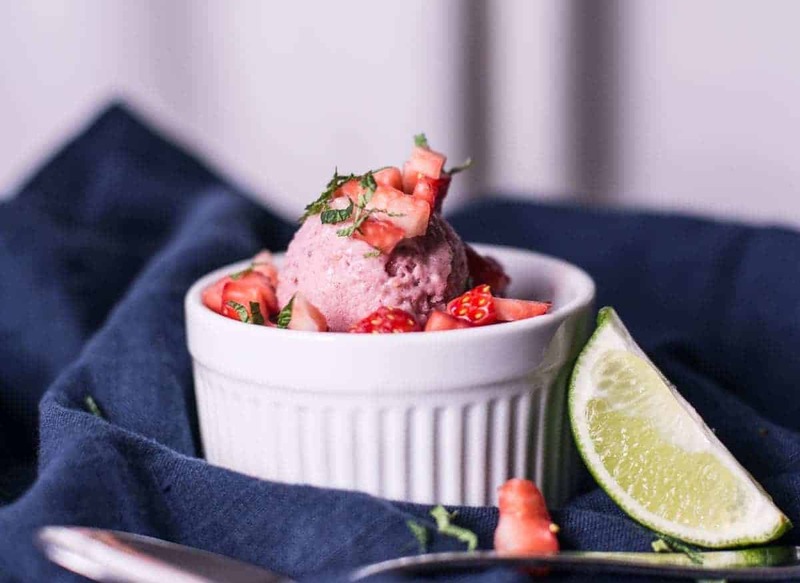 Fresh strawberries and frozen bananas are the foundation of this dairy-free, sugar-free version of ice cream. 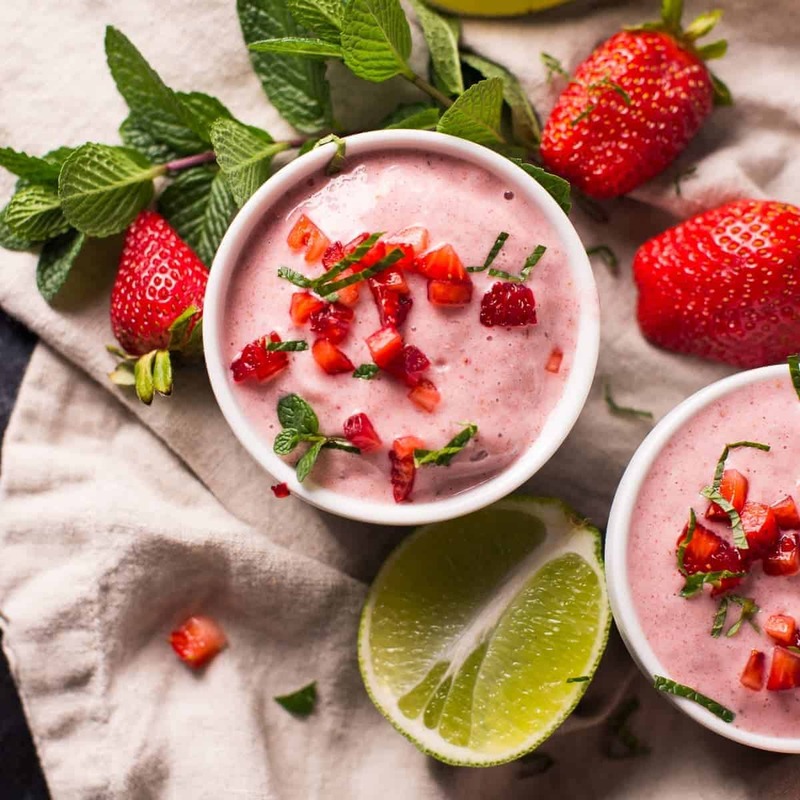 Topped with fresh strawberries, mint, and squeeze of lime makes this a refreshing and healthy fruit treat. Use frozen blueberries or mangoes to get a different flavor. Serve immediately – Nice cream will have a pretty soft consistency. Freeze for later – For a firmer texture freeze for at least a few hours. If frozen overnight the nice cream will be too hard to scoop right out of the freezer. Let nice cream sit our for 5-10 minutes before scooping.